Available in both Left-Hand and Right-Hand. The narrow blade gives superior control, and being manufactured from hardened steel ensures they hold a sharp edge longer than stainless steel knives. The perfect knife for hoof trimming. 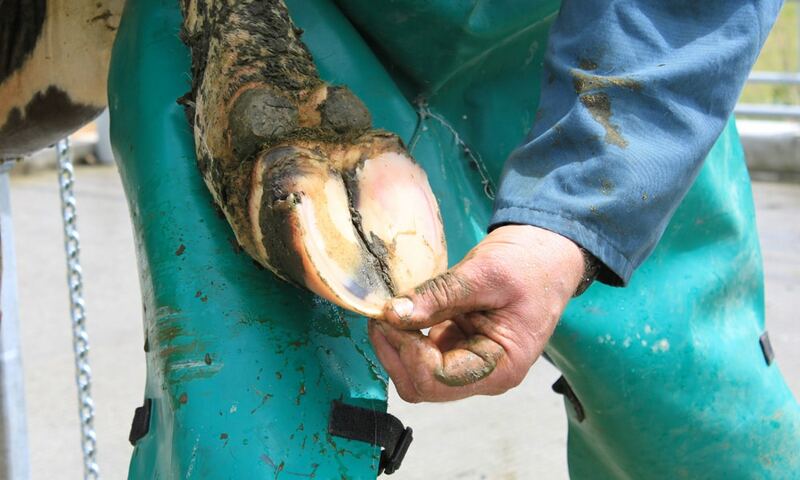 We supply all your hoof care and hoof trimming needs. We only supply the best quality equipment. 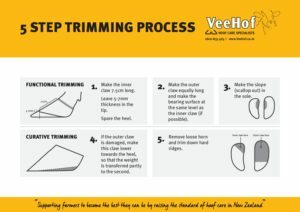 Check out our other listings that include hoof trimming knives, hoof trimming grinding disks, hoof cutters, pincers and grinding disks. A hoof knife should be very sharp. Sharp enough to cut a piece of paper held flat in the air without any support. 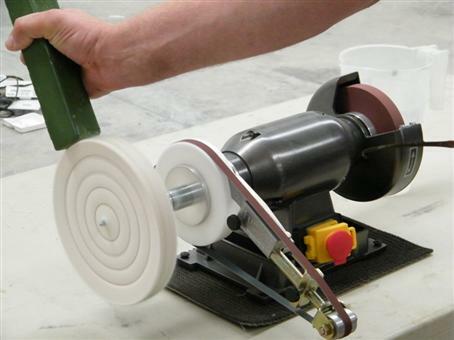 Ideally, sharpening should be learned from an experienced sharpener. As you can see in the photo to the left the machine has 3 applications attached to it. The first one (in use in this photo) is a cloth buffer used to remove the burr after grinding. The second application is the grinding belt that can be seen just behind the cloth wheel. The grinding belt runs around a tensioner and can be seen in the photo to the left just under the technician’s hands. 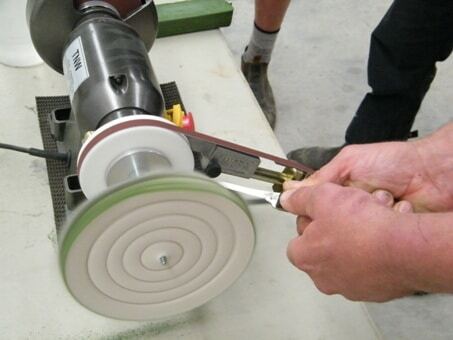 The grinding belt is used to grind a new surface on the knife. An example is shown in the next photo. The third application is the rubber wheel which can been seen at the far right of the machine. This allows you to sharpen your knife as over time a groove forms in the rubber which is the same shape as your trimming knives. Safety warning – The machine should have a screen or wall behind it to protect others in the case where a knife catches on the machine and gets pulled out of technician’s hands. 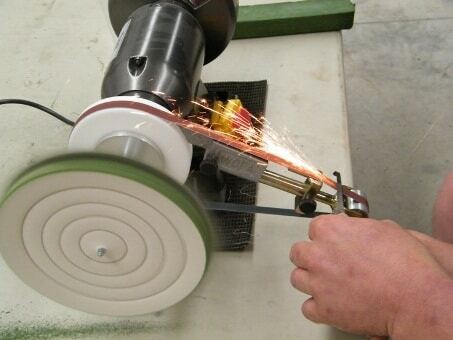 Also using the grinding belt or rubber wheel then safety glasses should be worn. In this photo you can see the technician using the grinding belt. When grinding, the knife’s steel should never turn blue. This is detrimental to the quality of the steel. Regular cooling in water may be necessary. Never grind the back side of the knife as this should be flat. The front side should be ground to an angle of 10 mm. The inside of the hook can also be ground with the belt if necessary. Once you have ground a burr on the edge of the inside of the knife, no further grinding is necessary. Finally, polish the burr off on the cloth wheel. Remember to keep the edge of your knife away from you, no pressure is needed when polishing the back side of the knife. Once you have done this your knife should be extremely sharp. Safety Warning – Once sharpened use something to cover the blade to keep your knife sharp and to protect the user from knife cuts. Old liners are perfect for this. Just give us a call. It is best to learn the techniques of sharpening from an experienced technician. Take no risks trimming is risky enough as it is. Sharpening must be learned from experience and it takes a little time become familiar with this skill.